We all make a simple ‘mistake’ as mothers – we decorate our children’s bedroom in a way that guarantees that we will have to hugely redecorate it within a few years. Fellow young moms know what I’m talking about: pastel pinks for the baby girls, cartoon characters surrounding the walls, a set-up that is far too ‘baby’ and not enough toddler or worse, tween or teenager. As your kid grows, so too increases their maturity level and their tastes and interests change. If you want to invest in redecorating every few years, by all means, set-up a bedroom that is hugely focused on their age and current interests. If you want to ensure that you design a bedroom that can ‘grow’ with the kids and remains relevant no matter the age, then follow the tips below! Forget about the typical pastel pink and light blue colors that we tend to pick for babies. It’s a cute color at first, but as the kid ages, they will outgrow the baby color. Instead, use a color or pattern that can pass the test of time. Light vanillas do generally well as they look clean and are a very standard wall color. Combinations of blues are great for boys as well. Another great option is to pick out a striped wallpaper (like these: www.wallcover.com/striped-wallpaper.html), which will give you a few shades of colors to work with. These sorts of patterns can look great no matter the child’s age and can adapt to their personal style and the furniture in the room. As a baby, my mother bought me a bed that could be extended with time. On the sides, you could easily put up two bars that kept me from falling as a baby and even as a toddler. Once I grew up, the bars went down into their sockets and the bed could be easily extended. That bed frame lasted me for 19 years… it was sturdy, strong, and literally grew with me. She probably saved hundreds of dollars by making that one solid purchase. These sort of furniture options are still available today and make for a smart buy. Instead of investing in expensive temporary furniture and paint options, you can express your kids’ personalities in their bedrooms with accessories. These are easily changed as they grow up and are not heavy on your pocket. 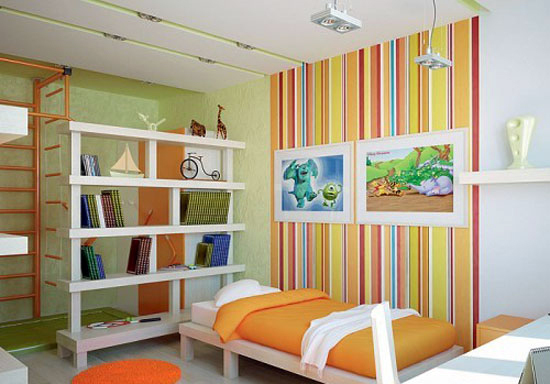 For example, instead of irremovable stickers, hang up paintings and framed pictures or drawings of cartoon characters. Little knickknacks can do some good as well and you can even let the kids choose them so that they can feel involved in the design process. Double-duty furniture can help you adapt to the needs of your kids as they grow up. Instead of buying a standard changing table, purchase a desk or ideally a dresser that can be fitted with a padded changing mat. Once your child grows, you can remove the changing mat and use the dresser or desk: it becomes a ready-made furniture piece that your kids will need. Another smart idea is to find beds with built-in storage underneath… toys and goodies will add up throughout the years and extra storage is always useful. The most important aspect is to always question the future: will your kids need the item 2 years, 4 years, or even 8 years down the road? If the answer is no, try to think outside the box and come up with another idea that can pass the test of time! This entry was posted in Home improvement and tagged best wall paper for kid's room, how to pick the best wallpaper for your kids' room, room improvement, wall improvement, wall paper on December 19, 2014 by Yami. our body needs rest. Without the proper rest or enough hours of sleep a day, we are doing a disservice to our body. It makes you feel sluggish and unable to think clearly and tend to have difficulty handling stress. Health experts have always said that a six to eight hours of sleep daily promotes a lot of benefits to our body. And recent development showed that lack of sleep affects ones appetite and makes you crave and eat more, thus induce weight gain. With proper diet and enough rest, there is no need for diet pills if at all you get the amount of sleep needed to function well. This entry was posted in Beauty and well-being and tagged benefits of rest, benefits of sleeping, sleeping on December 17, 2014 by Yami.